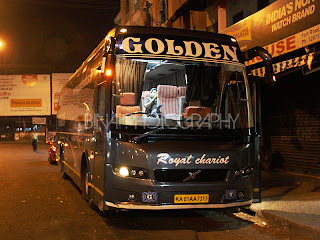 Golden Travels - Kannur to Bangalore by the two-axle B9R! I always wanted to travel to Kannur by bus from Bangalore once. The ghat section between Virajpet and Iritty has some brilliant curves – from what I heard. Sometime late last year, I got an opportunity to drive through the route as well. I never had a reason to go to Kannur by bus – always went by car. An opportunity to travel by bus suddenly appeared in the mid of December – a function at my relatives’ place. I had initially planned to avoid the event, but some other personal reasons coerced me to partake in the event. I was going there by car, but the return would be by bus – yippee!! 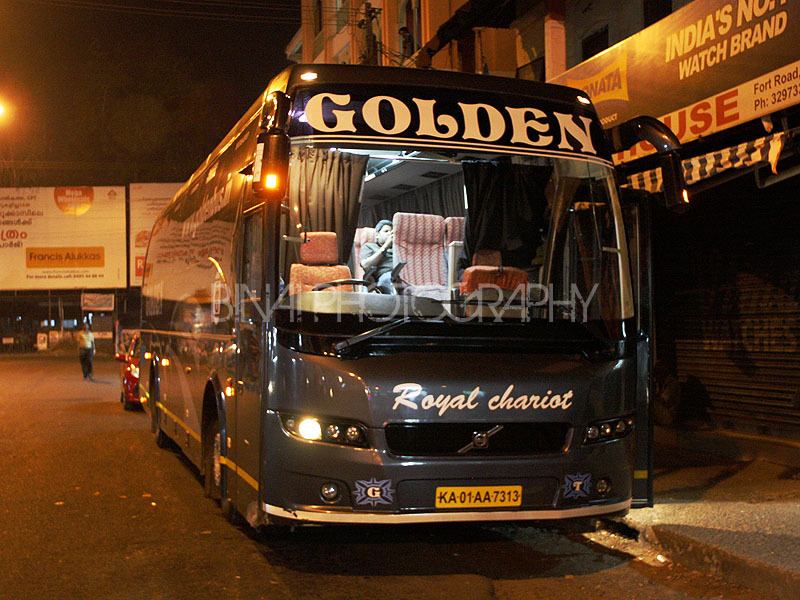 There are only two Volvo services to Kannur – one by Karnataka SRTC and the other by Golden. Golden’s Volvo is special. I first saw this bus in July 2011 – I did not notice what was special with this bus then. I saw the bus again in August 2011 – did not notice anything special even then. But a couple of days later, while looking at the photo of that bus, I noticed that the bus was special – went to check the bus again the next day, and confirmed that the bus was indeed special. Ah! Cut the cr*p – what is special? The bus was a two-axle B9R! A 340-hp engine powering a 12M bus! Now that was raw power. Some extensive searching on the internet convinced me that the model was very rare, and it surely was special. The bus fan in me wanted to try this bus desperately – me and a friend even planned going to Kannur just for the heck of trying the bus – but that never happened. When my opportunity came, it was a no-brainer decision to book the very same bus. The operator’s (Golden) website did not allow bookings for Kannur-Bangalore direction. So I booked through RedBus. I always make it a point to take a print out of my tickets – and this time too, I took a print out. I booked the ticket just the day prior to my journey, and managed to get a seat on the last but one row – seat #27. My journey to Kannur by car was largely uneventful except for the horribly horrible roads. It was one eventful day – busy with the function and later in the afternoon made a visit to Pappinisseri snake park and Parassinikadavu temple. Sometime in the evening, I got a message from RedBus reminding me of my journey, with an addendum that “You DO NEED to carry a print out of the ticket”. Normally RedBus asks you not to print, but this time it asked me to do so late in the evening – I thanked my fortune for having taken a print out long back itself. The bus was scheduled to depart at 2100hrs from Kannur. My brother suggested changing the boarding point to somewhere nearby, since Kannur was a good 28kms away. Later on, I decided that I should board from Kannur itself – I could catch up some sleep then. My brother agreed. We left home at 2000hrs – on the 28kms journey to Kannur through narrow roads. We made it to Kannur exactly at 2045hrs. I rushed to Golden’s office and showed my ticket. They issued a boarding pass and told me that the bus would leave at 2115hrs – so I still had 30 minutes to go. We (I, my brother and a cousin) we headed for a dessert at a nearby ice-cream parlour. We finished the dish and came out at 2100hrs and I saw my bus already standing there. I bid bye to my brother and headed towards the bus. I left my bag in the bus. The engine was running and the AC was switched on already. An FM station was being played. The bus started off at 2120hrs – with about 23 passengers on board. The engine’s growl was clear – I was enjoying the grunt of the 9-litre monster sitting below my seat. The bus: KA-01-AA-7313, ready to start from Kannur. No blankets or water bottle were provided. Soon after the bus started off, they switched off the FM radio and started playing a movie. Thankfully, volume was kept really low – it was a movie that I had seen already. I reclined by seat to the max and slowly pulled off to sleep. My adjoining seat was empty – the seat’s calf rest was not retracting – the spring was damaged. We reached Melechovva at 2130hrs, where one passenger got in. I just started sleeping – but the roads did not let me sleep. I switched on the GPS for some time to find out the route my bus was taking – we were just past Chalode then, and proceeding towards Mattannur. I was awake till we crossed Mattannur (one passenger got in here). I slept lightly after that and woke up just as the bus stopped at iritty – two more passengers got in – so we had 27 passengers on board the 41 seater bus now. I had some seriously deep sleep after Iritty – seriously deep that I did not even wake up when the bus went through the seriously horrible patch of roads past Iritty. I woke up just as the bus pulled into a hotel and the cleaner announced a break. He switched on the cabin lights, and the engine was switched off. The time was 0137hrs, and the place was somewhere outside Hunsur town. Our pairing bus too was standing there at the time. I got off the bus and realised that it was chilling cold outside – I used the restroom (not lit and in horrible shape). I took some pics of the bus. The pairing bus left a while before ours and we started moving at 0157hrs. The lack of blanket was disturbing my sleep now – the windows were fogged up due to the heavy temperature variation – it was cold outside and comfortably warm inside. I somehow managed to sleep after the bus got back on to the good road. I was expecting the driver to do some serious driving and make it to Bangalore earlier than scheduled. Despite the lack of a blanket, I managed to sleep. I woke up just when the bus fell into an XL sized pothole somewhere near Kengeri. I pulled up the backrest and decided to cut short my already short sleep. We stopped outside Mysore Road satellite stand to drop someone and continued the journey. Lights were switched on as the bus reached the KR Market flyover. We stopped near KR Market bus station at 0529hrs – some passengers got off here. We pulled into Kalasipalaya (TSP Road) at 0533hrs and stopped outside the Golden Travels office. A lot of passengers got off here and loads of parcel was unloaded. Some passengers got in here (people who came by various buses from the Malabar side and to be dropped at Madiwala). We started off at 0538hrs. The bus took the normal route via Lalbagh, Lakkasandra, Dairy Circle. I was in confusion if I should get off at NIMHANS, but was afraid if I’d get buses at that time to Bannerghatta road – just then a Volvo to Bannerghatta road overtook us! I now decided to continue to Madiwala. We reached the last stop (opposite Friends Travels) at 0555hrs. I then took an auto to head home – the meter was surely faster than the auto. End remarks: The bus, KA-01-AA-7313, had some 2.01 lakh kms on the odo. The maintenance was above average – no dents on the body or broken lamps. The interiors were in good shape. Some seats had a damaged Calf recliner mechanism. There were occasional squeaks – thanks to the bad roads. The interiors were clean. No blankets were provided (as mentioned earlier). The bus was scheduled to arrive at 0530hrs (RedBus says that is the arrival time at Madiwala) – it came in 25 minutes late. No complaints though. The departure itself was 15 minutes late. I think they should provide Blankets – it’s difficult to sleep without a blanket/shawl. I kept both the AC vents closed, but that did not really help matters. I loved playing movie at a low volume – those who want to see can concentrate while the others to catch forty-winks. The driving was really good – no honking at night, or rash brakes. The driver maintained proper rpm all the time – it was musical to hear the grunt from the engine. The journey time seemed a bit on the higher time – especially since the distance was only 320kms! The end to end journey took 8 hours and 35 minutes – the driver drove really slowly after Mysore so that the bus does not land up in Bangalore too early. May be they could delay the departure a bit, so that the bus reaches at the same time. Will I take this service again: I am not a regular on that route, but would love to try them/recommend them. So the two-axle B9R is really rare? I thought all the KSRTC Airavats after 2011 were B9Rs. So any external cosmetic differences between the B9R and B7R then? Also operating such a powerful vehicle in the bad road stretches in the Bangalore-Kannur road. Is it a wise decision, considering the maintainence required for the bus? B9R and B7R are chassis - there is a lot of difference between the chassis - the placement of the air-intake is different, the engine looks very different, and so on. The bodies look identical except for the rear engine grilles. KSRTC does not have two-axle B9Rs - in fact, the two-axle B9R is a very rare product - simply because the extra 10lakhs for the product does not make much sense.